Conference: Saturday, March 5, 2016, 8:15 a.m. to 5 p.m., Four Points By Sheraton, Room Bristol AB, 1150 Wellington Road South, London ON. 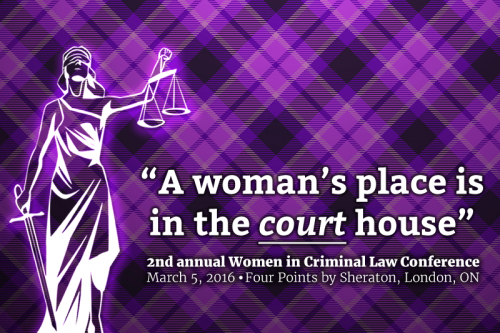 A Woman’s Place is in the Court House – 2nd Annual Women in Criminal Law Conference program to be held on March 5, 2016 has been accredited for 2 hr 20 min Professionalism Content. This program is also eligible for up to 4 hr 10 min Substantive Content. Registration is now open for the Criminal Lawyers’ Association’s 2nd Annual Women in Criminal Law Conference. 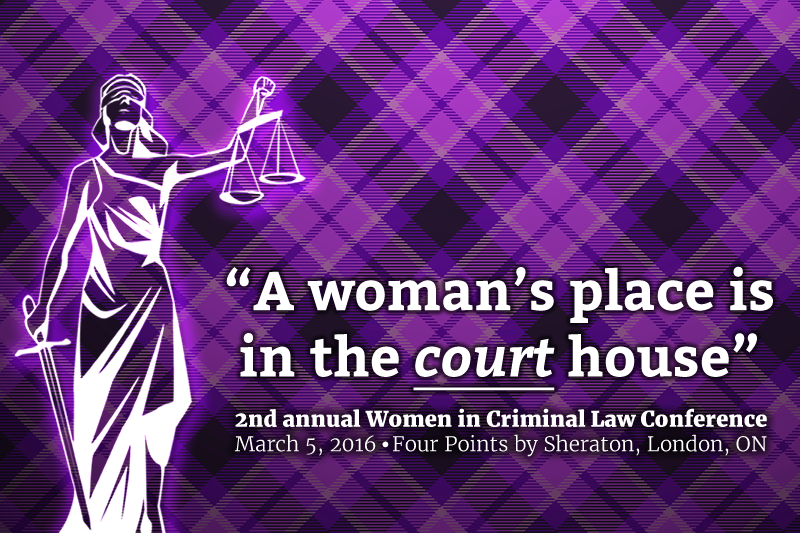 Organized by the CLA Women’s Committee, this event will be held on Saturday, March 5, 2016 at the Four Points by Sheraton in London ON. There is also a great opportunity to network with your colleagues being held Friday, March 4. Female defence lawyers may face unique challenges in building and maintaining a practice in a field still dominated by men and framed by men’s expectations. 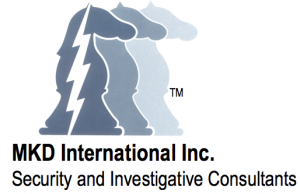 This conferences explores these issues with a unique and diverse program and speakers. Our Keynote Speaker will be The Honourable Lise Maisonneuve, Chief Justice, Ontario Court of Justice. As both the Spring and Fall CLA conferences are held each year in Toronto, the Women’s Committee is proud to hold this event in London to provide greater opportunities for members to attend and meet colleagues from across the province. The conference is in person only. Advance registration required. At the door registrations will not be accepted. *If you are on, or recently returning from parental leave, or experiencing financial difficulties please contact John Chagnon at the CLA Office as you may qualify for special pricing options. There is a separate fee for the social and is open to both conference and non-conference attendees. Registration includes access to the Friday social, one beverage and passed hors d’oeuvres. Register securely online with visa, mastercard or debit by going to http://www.karelo.com/register.php?BID=372&BT=10&Ev=16007. By registering online, you will receive an instant receipt and confirmation. If you’d prefer not to register online, please download the registration form PDF, complete and submit with payment to the CLA office by March 1, 2016 (or before spaces sell out). Payment must be received for registration to be accepted. The CLA has secured a special rate of $119 plus tax per night at the host venue (for a Superior King Bed or 2 Queen Bed Guest Room). The rate is available before February 2, 2016. To book, you must call the Reservations Manager and note you are part of the Criminal Lawyers’ Association. Please call 1-519-681-0600 x8203. For cancellations received by February 22, 2016, a full refund is available minus a $50 administration fee. No cancellations will be accepted after February 22, 2016. Substitutions will be permitted if the office is notified by March 1, 2016. All cancellations must be submitted in writing by email ([email protected]) or fax (416-968-6818). The CLA very much appreciates the support of our sponsors. To ensure you or your firm are acknowledged in the conference materials, confirmation of sponsorship must be received in the CLA office by February 20, 2016. 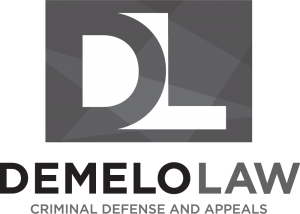 To submit, please download the sponsorship package and complete and submit the last page: http://criminallawyers.ca/wp-content/uploads/2016/01/CLAWomensConferenceSponsorship2016.pdf. Questions/Comments? Please direct to John Chagnon.